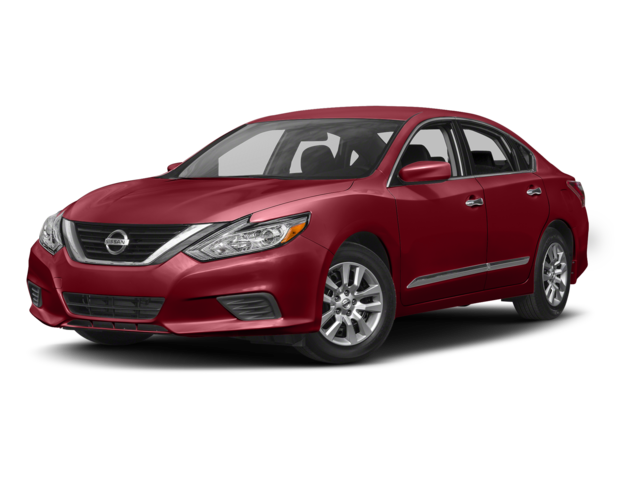 Sorg Nissan Invites You to Explore the 2017 Nissan Altima! 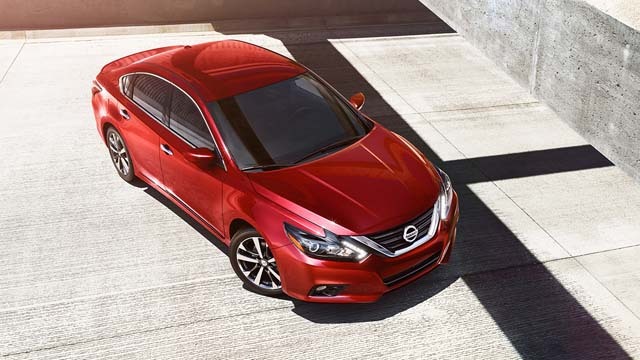 The 2017 Nissan Altima has it all: not only does this car come equipped with a selection of powerful engines that generate solid horsepower rates and promise solid levels of efficiency, but it also comes with some top-notch driver assist features. Meanwhile, this is one smart vehicle, with a range of new technologies as well as a broad spectrum of safety devices designed to keep you and your passengers safe and sound on the road. Plus, the Altima is impressively inexpensive, entering the market in a number of affordable trims. Check out the details by reading on! From its epic engine power, to its splendidly constructed Xtronic CVT transmission system, to its impressive efficiency rates, its paddle shifters and manual mode, and its dynamic suspension and active understeer control, the all-new 2017 Nissan Altima gives drivers from Indiana a memorably high-performing drive. Let’s look at each of these perks in turn. First thing’s first: the Nissan Altima offers drivers a choice between two wildly powerful engines. On the one hand, you can opt for a 2.5L DOHC 16-Valve 4-Cylinder machine that generates 179 hp as well as 177 lb-ft. On the other, you can select a 3.5L DOHC 24-Valve V6 beast that churns out as much as 270 hp and 251 lb-ft of torque. Thus, no matter what, you’re going to be able to look forward to some rock-solid horsepower rates in the new Altima. But we’re just getting started, for in addition to power, the Altima also gives you a famously smooth ride, with an Xtronic Continuously Variable Transmission system, which offers you lightning-fast step shifting, wider gear ratio coverage, and an adaptive shift controller. Not only will you be able to look forward to a drive that is more economical, but you can also expect even more power, with the Xtronic system offering up distinctive shift points and guaranteeing even greater engine force. 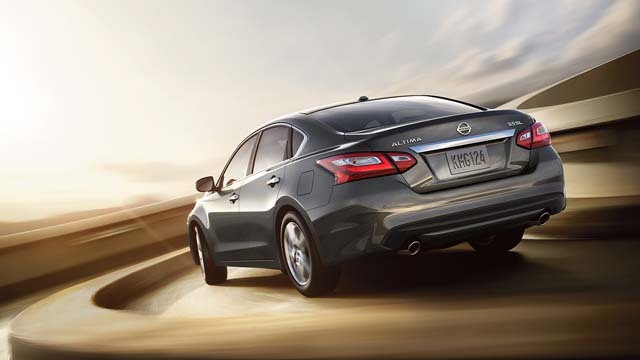 Moreover, the new Altima also boasts unique emissions rates and strong fuel economy levels. For example, depending on the trim you choose, you’ll be able to expect either Tier 2, Bin 5( LEV3-SULEV30) emissions, or a Tier 3, Bin 125 rate. 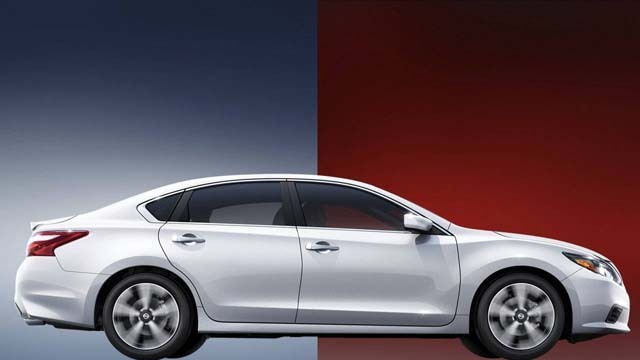 At the same time, when its equipped with Xtronic CVT, the new Altima gives you either 39 mpg on the highway and 27 mpg in the city or 32 mpg on the highway and 22 mpg in the city. What’s more, the Nissan Altima gives you a range of options when it comes to choosing what sort of drive you want to experience. 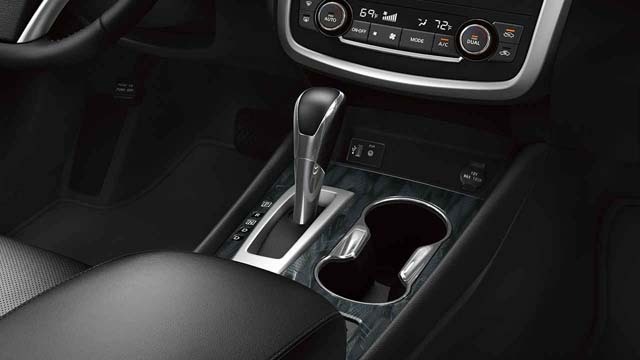 You can always opt for automatic transmission, simplifying the drive significantly on those long trips down state. Yet you can also rely on the car’s paddle shifters to activate its manual mode if you want to experience a more viscerally enthralling, more raw automotive experience. 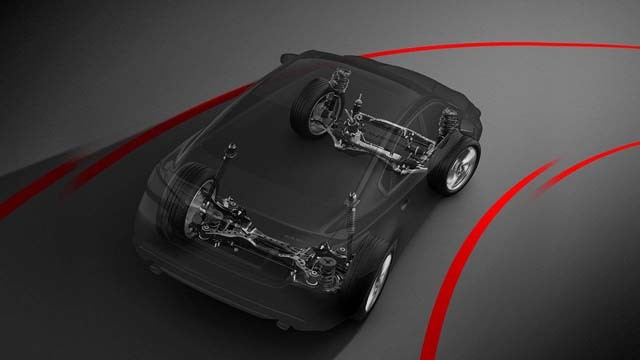 Not only that, but the Altima also improves your drive even more by coming embedded with a number of different suspension systems. First, the Altima is equipped with independent strut front suspension on the front wheels, but it also features a multi-link independent rear suspension system in the back. Meanwhile, you can also select to outfit the car with sport-tuned suspension, as well as ZF Sachs shock absorbers as well. Finally, the Nissan Altima also offers up a carefully designed Active Understeer Control system that is able to evaluate any cornering situation in which you find yourself and then apply the brakes to any particular wheel in order to ensure that you take the corner as smoothly and safely as possible, thereby contributing both to the vehicle’s safety and performance. Yet in addition to all its power and impressive performance, the 2017 Nissan Altima is also outfitted with a spectacular range of technologies—including Bose Premium Audio, SiriusXM Radio, USB Ports, NissanConnect, and Steering-Wheel-Mounted Audio Controls—as well as a comfortably appointed and spacious interior. Explore each perk by reading on. We might as well begin with this car’s luxurious interior design, which keeps drivers and passengers alike comfortable throughout the drive. 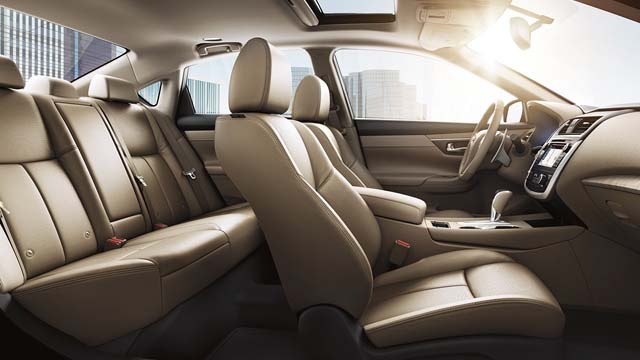 On the one hand, the Altima comes with heated front seats, a heated steering wheel, and leather-appointed seats in upper trims, as well as gorgeous black trim or brushed silver wave or carbon wave trim. Meanwhile, you’ll get in addition to seating for five as much as 101.9 cubic feet of passenger room, and 15.4 cubic feet of cargo volume, as well as 60/40-split fold-down rear seatbacks, thus improving this vehicle’s versatility and flexibility. Next, the Altima also boasts a 9-speaker Bose Premium Audio system, which enables you to operate the sound system by using either a 5-inch or a 7-inch color monitor. But it also comes embedded with speed-sensitive volume control, which can automatically change your music’s volume depending on how much road noise you’re experiencing. 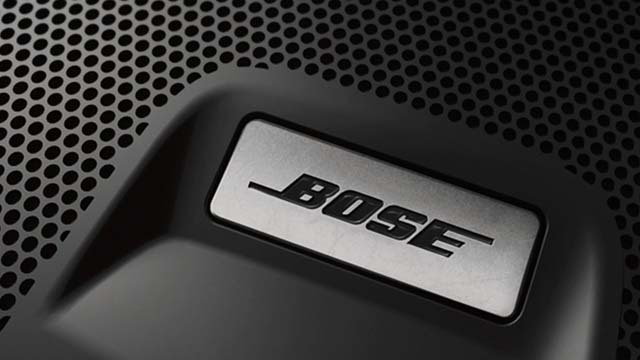 Keep the tunes playing and the bass booming with this stellar Bose Premium Audio system. 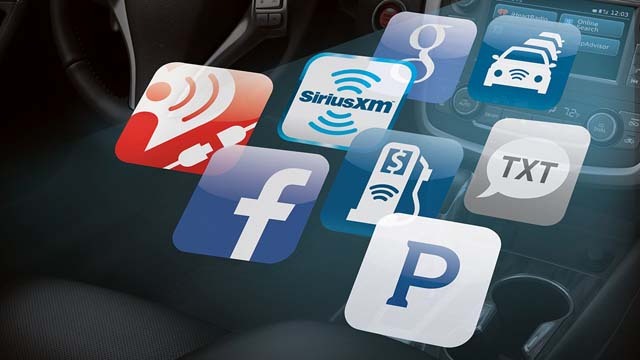 Likewise, you’ll enjoy a wide range of musical options in the Altima, with its stellar SiriusXM radio access. Not only that, but drivers are able to listen to all the sports, news, and talk radio that they can handle via the Altima’s other radio stations, while also gaining even more entertainment options via its reliable Bluetooth wireless technology, which keeps you informed, connected, and engaged. 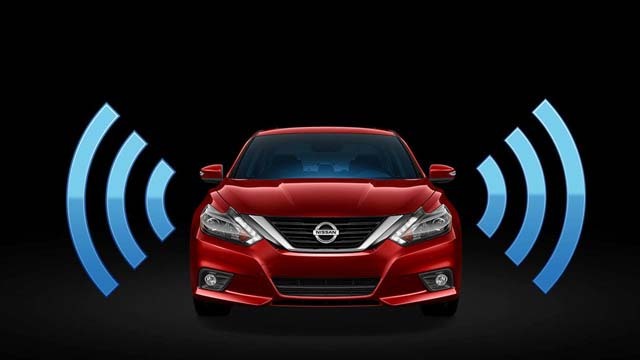 As if that weren’t enough, the Altima also comes with NissanConnect, which allows you to plug your smartphone directly into the car and enables you to gain access to all your own music, your own apps, your own maps, and much more. Indeed, so sophisticated is NissanConnect that you’ll even be able to place calls and send texts to your friends and family via touchscreen or its powerful Voice Recognition software. Nor will you ever have to worry about losing power on your devices. With the Altima’s set of dependable USB connection ports, you can recharge your phone or tablet throughout the drive, ensuring that you’re never going to lose your connection to your friends or go without streaming internet. 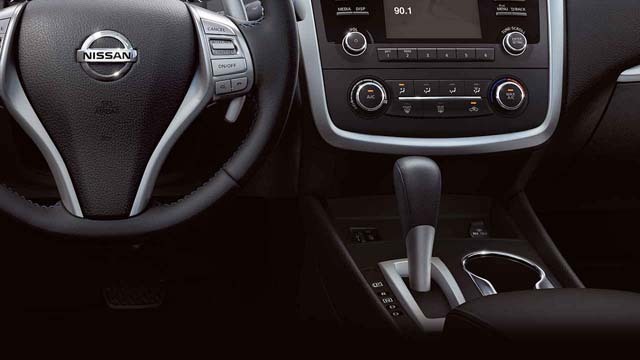 Not only that, but you’ll be able to enjoy even wider musical options courtesy of the Altima’s USB ports. 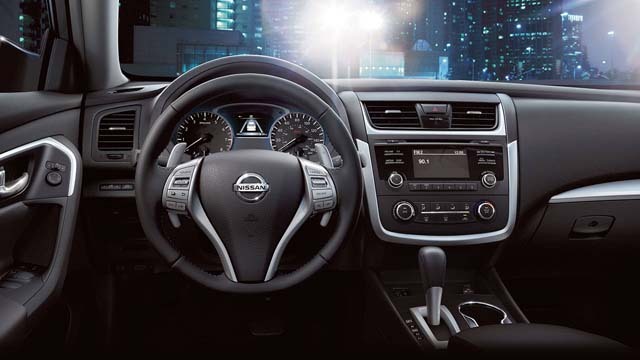 Likewise, the Altima makes adjusting your audio a piece of cake with its space-age steering-wheel-mounted audio controls. Embedded along the steering wheel itself, these controls can be used to turn up (or down) the volume on the stereo, make track selections, and operate a range of other devices as well, all while allowing you to keep your hands on the wheel where they should be. 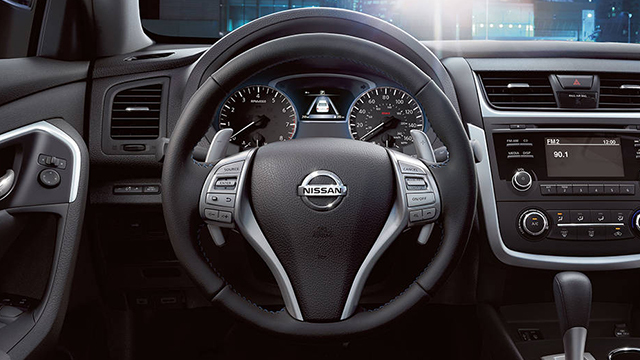 Stay safe and in control with the Altima’s steering-wheel-mounted controls. Last but not least, the 2017 Nissan Altima has also been designed with your safety—as well as that of your passengers—in mind, boasting safety devices like an advanced airbag system, Vehicle Dynamic Control and Traction Control, a Blind Spot Warning system, a Rear Cross Traffic Alert, Predictive Forward Collision Warning and Forward Emergency Braking, and Hood-Buckling Creases and Crumple Zones. For starters, the Altima is designed to keep you and everybody else on board encased in a reliable web of protection with an assemblage of airbags. For example, the Altima comes embedded with dual-stage supplemental front air bags with seat-belts and occupant-classification sensors, as well as driver and front-passenger seat-mounted side-impact supplemental airbags, roof-mounted curtain side-impact supplemental airbags, and additional front- and rear-seat outboard occupant head protection. Indiana winters can turn treacherous at a moment’s notice, and that’s why you’re going to want a vehicle that you can trust. 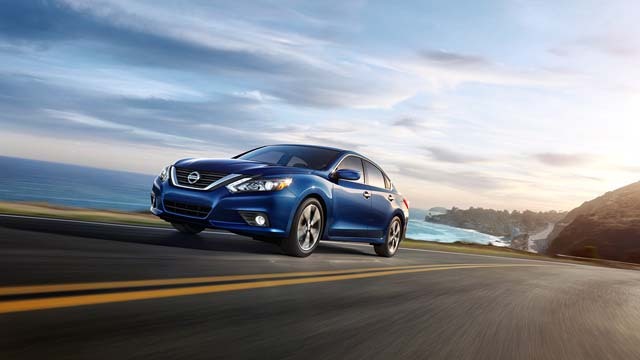 Luckily, the Altima is able to stay safe even while operating on the highway. 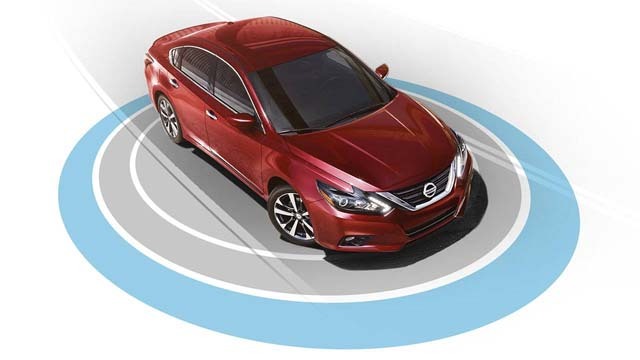 With its Vehicle Dynamic Control, the Altima can survey its wheel-spin rates and compare them to your turning angle in order to determine when it may be in danger of losing its stability, while also maximizing traction via its Traction Control system. 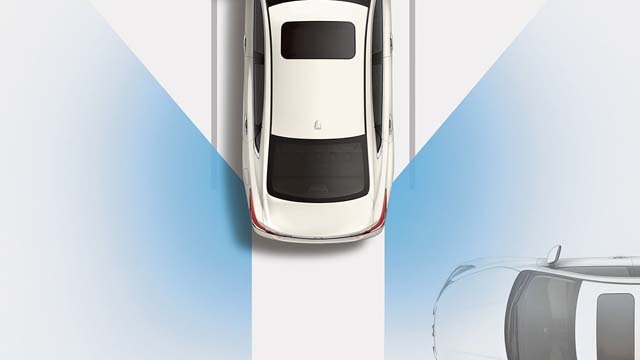 In addition to all this, the Altima also boasts a well-constructed Blind Spot Warning system that is able to examine the area around your car and determine when another vehicle has entered your blind spot. 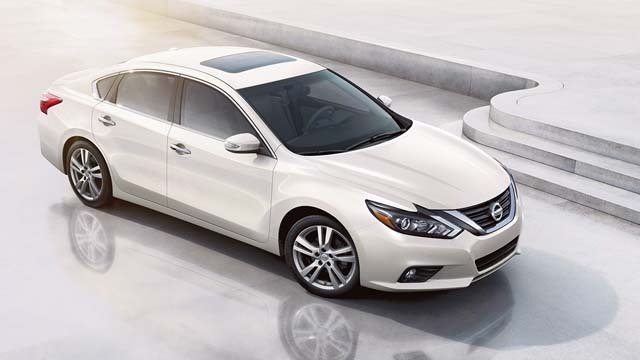 By alerting you to currently invisible vehicles, the Altima allows you to more easily avert potential collisions while out on the highway, while also giving you even an greater peace of mind that you’re aware and in control of events around you. Plus, this car also offers a Rear Cross Traffic Alert system that is designed to ensure that you’ll be able to back out of parking places without ever having to worry about colliding with other cars. If your Altima senses the presence of another car in your vicinity, it will warn you of its approach, enabling you to avoid any accidents. 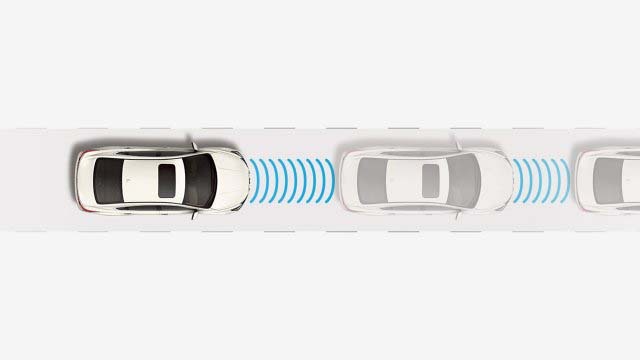 Meanwhile, the Altima is equipped with both Predictive Forward Collision Warning and Forward Emergency Braking. 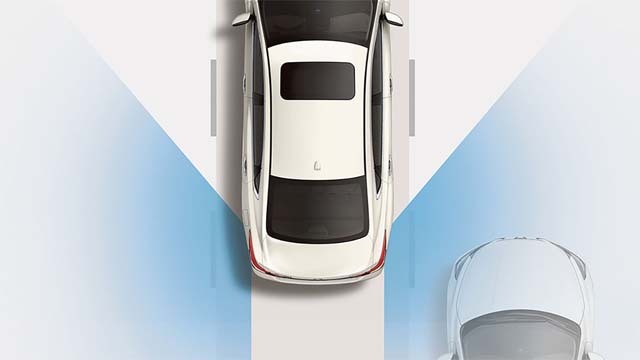 The first system relies on a sensor that is positioned at the front of the Altima to survey the area in front of the vehicle for other cars and identify cases in which sudden deceleration threatens to cause an accident. Likewise, the Altima’s Forward Emergency Braking makes it possible for you to respond immediately to such threats. Finally, the Altima’s very body is designed to keep you safe in the unlikely event of an accident. On the one hand, with buckles built-in to the car at certain pre-determined points, the hood will be able to crumple rather than break into your driving compartment, thereby helping you avoid serious injury during an accident, while its crumple zones are similarly designed to keep you and other passengers as safe as can be by channeling the force of an impact away from you and any others inside the cabin.